There aren’t many home improvements that will transform your rooms with style, warmth and beauty as cost effectively as a restored or hard wood floor. Speak to three different contractors out looking after wood flooring and you’ll pick up a minimum of two distinct views on the matter. In this blog post, I’ll give tips on choosing, buying and maintaining your floor. 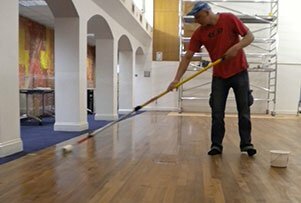 Does hard wood floor sanding produce lots of dirt and dust? No, it does not. Our aim is to achieve a working, as well as living, healthier indoor environment. By using the latest generation of the wood floor sanding equipment, we have managed to reduce the dust that goes in the air, as little as 2%. You may have heard that there is 100% dust free, but that is only a marketing myth, that companies used to promote their services or equipment. How much time would it take to completely renovate a hard wood floor? What is the difference between hard wax oil and varnish floor finishes? The varnishes differ from hard wax oil in the way they seal the flooring surface. Varnishes provide the flooring with protective surface coating, while the hard wax oils penetrate into the floorboards.